I’ve always been fascinated by arcades, those ‘shopping mall precursors’ in cities where a set of shops runs in a corridor through the middle of a building. Paris and Brussels have a couple of great old ones, I even like the modern Funf Hofe in Munich, but for some reason I never noticed Prague’s arcades on previous trips. This week, while walking around aimlessly looking for a good place to eat (one of my favorite activities), I found myself in a really cool one, the Lucerna, which made me notice many more. Like most of Prague all the arcades I visited are showing their age. Most of the shops, restaurants and cafes located in them are not flashy or the latest trends (in contrast to Munich!) but seem to cater to the normal needs of locals. 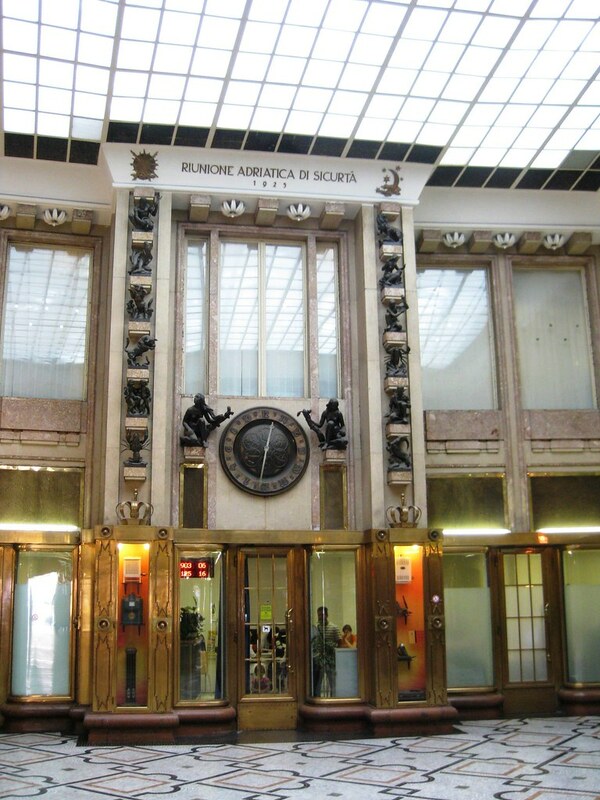 The Lucerna, like many of the arcades, was actually a series of arcades connected together so they differed stylistically and in terms of tenants and state of repair. Only one of the arcades is actually the Lucerna, the others were called Rokoko and Dum u Novaku (sorry for not using the Czech spelling, no keyboard). These were particularly interesting since the connected arcades were in very different styles. 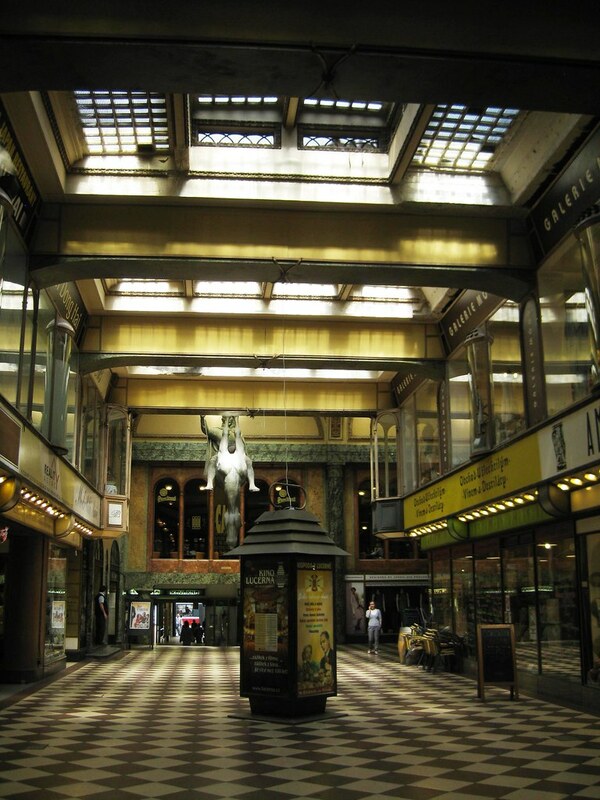 The Lucerna arcade is built around a movie theater with several places to eat and a music/beer club. The architecture features lots of marble and a huge hanging sculpture of a knight riding a horse, but the horse is upside down (feet up) and the knight is riding on the horse’s stomach (see top photo). I had a coffee in the coffeehouse with windows over looking the sculpture. The coffeehouse was great, it was clear that it was used for performances (there was a grand piano), there were some children playing in a corner with the parents having a coffee and chat. The cafe probably gets lots of visitors after shows. The Adria arcade was located on Jungmannova Street near my hotel. 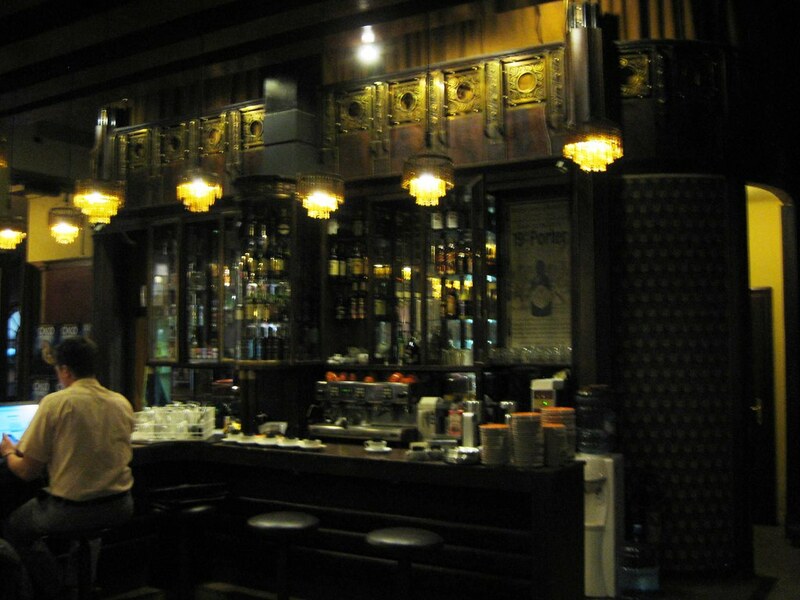 There I was most impressed with the old art deco architecture and decorations. 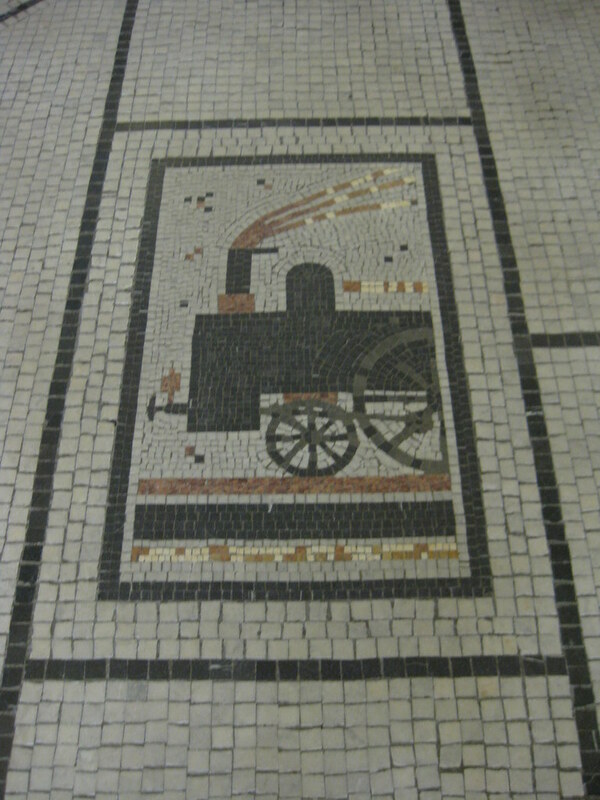 The mosaic caught my eye with two railway scenes. There was a very nice old sign for a record producer around the doorway of a former tenant. As I left I noticed that the building seemed to have originally been built for one of those old transport insurance agencies (there was a sculpture with a powerful figure seeming to protect a ship in heavy seas). 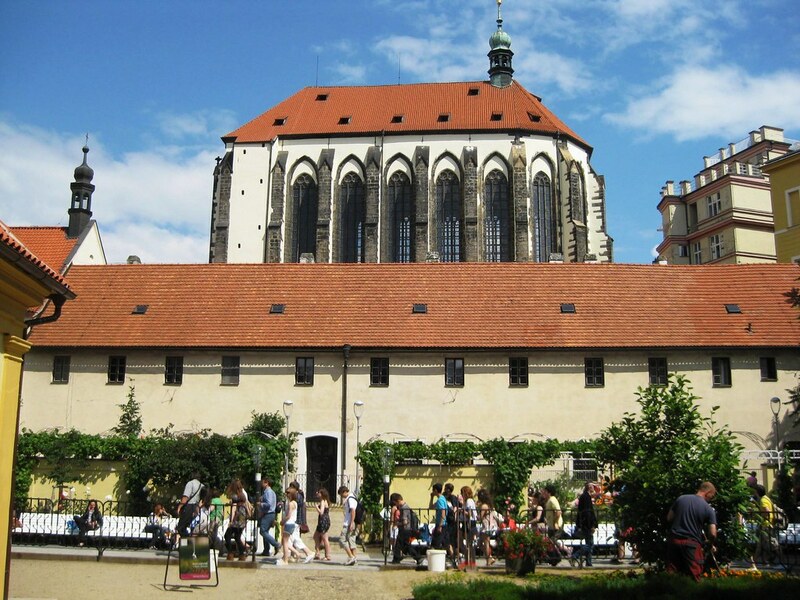 Not really an arcade, but opening on to one, was the Franciscan Cloister garden. This is a truly beautiful urban open space. Located in the middle of a block, it’s a quiet oasis (except for the sound of children playing) in the center of the city. It’s well maintained with beautiful flowers and lots of benches (many of which are full). 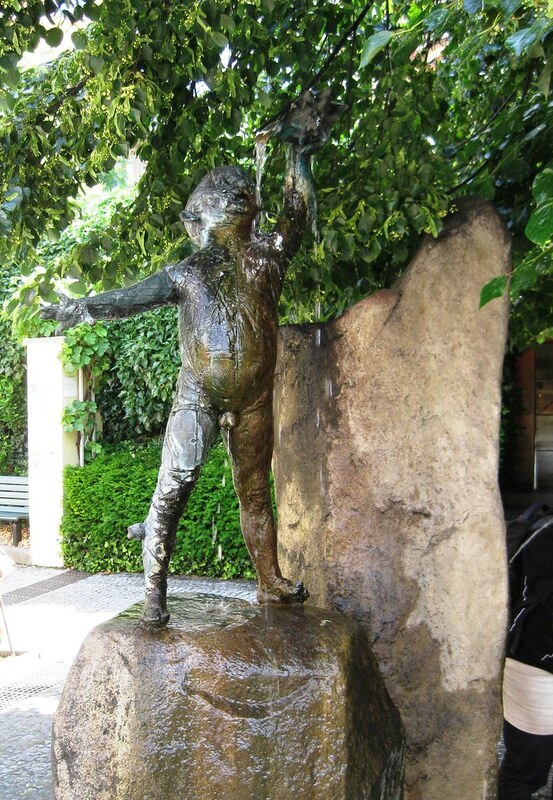 There’s a great fountain sculpture of a naked child playing with water … the children around all loved it. Finally, I discovered the Trznice arcade on Rytirska Street. I was drawn in by a beautiful painting of a market scene over the interior doorway (photo). As I walked though I found that the arcade had been remodeled with a grocery store, drug store and a couple other 1980s style shops. The space itself had been given one of those dropped ceilings (it was still quite high) but there was a skylight through which you could see the original metal and glass roof (photo). It’s too bad there is not enough money to rehabilitate all these beautiful structures. All my Prague arcade photos are here.